Parents are most welcome to visit the school, by appointment with the Headteacher, before deciding whether or not to make an application for a place. We allocate places at Community Primary, Infant and Junior Schools using the policy below and co-ordinate admissions to Gateshead schools using the co-ordinated admission scheme. Your child will start school at the beginning of the academic year in which they will reach the age of five. (An academic year lasts from 1 September in one year to 31 August the following year). Children are entitled to a full time place as soon as they start school, however in most schools, the first term will include an induction period, (a period for your child to get used to school life gradually, generally lasting from September to October). Although, you may request that your child attends school part-time until later in the school year, but not beyond the point that your child reaches compulsory school age. In addition you may request that your child be admitted to school later in the school year following September 2017, but not beyond the point at which they reach compulsory school age and not beyond the beginning of the final term of the school year (i.e. April 2018). We will accept pupils up to the schools agreed Planned Admission Number for the year group unless we feel there are lawful grounds not to do so. Parents may request a place for their child outside their normal age group, for example gifted and talented children, children that have suffered ill health or parents of summer born children (children born from 1 April 2013 to 31 August 2013). All cases of admission of children outside their normal age group must be discussed with the LA prior to the application being made. Such requests must be made on the Common Application Form which is available from 9th September 2016. You must detail the circumstances of your case and include any supporting information form relevant professionals. The LA will consider each case individually and you will be notified of the outcome of your request on or around 18 April 2017. Please refer to the ‘Admission to Primary School’ Booklet for further information regarding deferred entry and admission of children outside their normal age group. Children in Public Care (as defined under Section 22 of the Children Act 1989) including a child who was previously “looked after” but ceased to be so because they were adopted (or became subject to a child arrangements order or special guardianship order (see definition*). Other children who live in the school’s catchment area. Other children who will have a brother or sister at the school or at the feeder junior school during the coming academic year. Point 1-We can consider exceptional individual applications, particularly in cases involving medical or social needs. If you wish to apply on medical or social grounds you must provide written evidence from relevant registered health professionals i.e. a doctor or social worker. The evidence must demonstrate why the chosen school is more appropriate and what difficulties would be caused if they were to travel to and attend alternative schools. We will not consider such applications if the relevant professional evidence is not provided. The evidence will be assessed by the LA Admission Panel. No assumption should be made that submission of the relevant evidence will, in itself, be sufficient to allocate a place. This school has the same oversubscription criteria as priorities 1 to 6 above except that criteria 3 and 4 above are reversed. Priority 1, 2, 5 and 6 remain in the same order however for this particular school their oversubscription criteria places priority 4 children above those children in priority 3. For the purposes of deciding whether a child lives in the catchment area of a school we will use the parent or legal guardian’s address or the address of a relevant adult who has parental responsibility, as defined under the 1989 Children’s Act, for the child. If, within any of the above criteria, there are more applicants than places available priority will be given to those children based on the distance they live from the school, measured ‘as the crow flies’ i.e. in a straight line from the centre of the home residence to the school’s main entrance. Children living nearest to the school will have priority. We measure the distance using a geographical information system (GIS). Where two or more applicants share the exact same distance, a random allocation process will be used to determine the ranked order of the applications in question. If places become available we will consider all relevant applications based on a waiting list. The waiting list will be maintained by the council from the start of the academic year and be kept for the rest of the academic year. All applicants on the waiting list are placed according to the admission criteria and priorities set out above. However children who are the subject of a direction to admit by the LA or who have been referred for admission and have been allocated a place through the Fair Access Protocol will take precedence over any child on the waiting list. From Friday 9 September 2016 you can apply for a place in a reception or junior class for admission in September 2017 by applying on-line at www.gateshead.gov.uk. You must submit your application by no later than Sunday 15 January 2017. Alternatively parents wishing to submit a paper application form must ensure that they request a copy in sufficient time and return it to The School Admissions Team, Dryden Centre, Low Fell, Gateshead, NE9 5UR by the closing date. If you live outside of Gateshead and want to apply to a Gateshead school you must obtain an application form from your own Council and return it to them by their closing date or apply through their on-line application system. 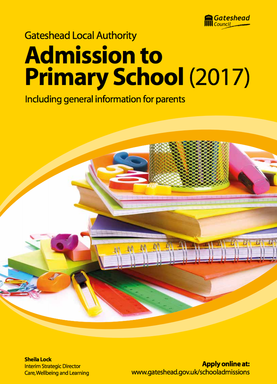 However you must still consider the information in Gateshead Council’s “Admission to Primary School” booklet so that you know what the admission arrangements are to Gateshead schools. This information is available at www.gateshead.gov.uk. Your own Council will send us notification of your application and they will let you know the final allocation of a school place for your child. The offer day is Tuesday 18 April 2017, a letter will be sent to Gateshead residents informing them of the school they have been offered for their child on or around this date. Gateshead residents who apply on-line will also receive an email on Tuesday 18 April 2017. For information on our admission arrangements and definitions of the terms used in this policy please refer to our “Admission to Primary School” booklet for 2017 available at www.gateshead.gov.uk. The co-ordinated admission scheme and Catchment areas referred to in this policy can also be viewed at The Dryden Centre, Evistones Road, Gateshead, NE9 5UR and on the website above.